Bistecca offers two parking options for our guests, both complimentary. Street parking is available downtown Kincardine on Queen Street, parking is parallel style. Alternatively, there is a free public parking lot at the rear of the restaurant. Access to the restaurant is through the public walkway beside the Royal Bank. Unfortunately, there is no public transportation in Kincardine, Ontario. We are a short walk from most hotels, inns and B&Bs in the downtown area as well as our town's picturesque piers, harbour and lighthouse.There are taxi options available within Kincardine. Please contact the restaurant at (519) 396-2333 for assistance. Chef and his team are happy to provide you outstanding off-site catering for your event. Please contact Bistecca at (519) 396-2333 for more information. Bistecca offers several options for parties greater than 7 guests. We are able to reserve a portion of the restaurant for your dining needs or for a more exclusive event, we are able to privatize the dining room depending on your dining requirements. Please contact the restaurant directly at (519) 396-2333 for a variety of private party options. Located in beautiful lakeside downtown Kincardine, Ontario, Bistecca will be known for being authentically contemporary Italian by delivering warm and genuine hospitality. Bistecca will provide an atmosphere where Guests can come together and socialize over delicious Chef-crafted dishes, Kincardine's largest wine offering and refreshing, seasonal inspired beverages all while receiving outstanding, uncompromising service. Would most definitely recommend to a friend. Food, ambiance, service was very good. Chef came out to talk to us. Very friendly & personable. Will come back next time in Kincardine. Pricey but everything, everything was delicious! Service was prompt and attentive, but not rushed. The chef even came out to chat with diners. I am not Jason but I am the one person that the chef came out to talk to about my food restrictions. I was so appreciative of the care he took to prepare me a delicious mushroom soup and using no oils, or dairy in the preparation of the Pappardelle mushroom dinner. The personal attention to detail was wonderful. As for the others who ate met dishes, they loved them. Thank you again. Just sorry I didn't think to get the Chef's name. I would recommend the restaurant again. Shared the Chicken Liver Pate with my wife - A great start! For mains, my wife enjoyed the Butternut Squash Ravioli and I found the evening special Seafood Risotto was unbelievably delicious!! Light and fluffy chocolate mousse for dessert complimented the meal perfectly. Thank you!! Fantastic food ! Great ambiance ! Pleasant food and service but there was a mix up (!) and our order for the main course was lost for nearly an hour. Staff did what they could to make amends and the evening was very pleasant but the delay was disappointing. It took a while for our server to take our food order and do bring us the bill but otherwise, we really enjoyed our experience and meal at this restaurant! The food was awesome, the noise level was up a little because of a large table celebrating a retirement. The wine suggestion was spot on and the dessert was a taste adventure. Absolutely recommend this restaurant to anyone in Bruce-Grey counties and further away. Definitely worth your trip to Kincardine. Friendly and attentive service, excellent food, great atmosphere. This was our first visit, it was for my birthday, hubby had the special ribeye and was sceptical yet impressed. I had the roasted chicken. The app, we shared the chacuater board, which we debated on the parm. potato soup. The flavours on the board were delicious. We were very happy with our choices and will be back to try terms on the menu. Thank you! We were too full for dessert lol! We ordered strip loin steaks and frittes as we love BBQ. I found the steak had no BBQ flavours and the frittes were over spiced and over salted. Some may prefer this but I like the BBQ. I enjoy my steak on my big green egg. Nice ambiance. Staff was pleasant. Be prepared to have plenty of time to enjoy your meal. I had soup of the day-potato bacon, excellent, chicken supreme- mashed potato and vegetables,excellent, chicken slightly dry and overcooked to my liking, finished with apple dessert, excellent. Great food and excellent service. Really enjoyed both of the times I’ve been here and would happily go again. Good food. Comfortable seating arrangements...food selection was great..
We had a great experience. Good memories too as our Grand Mother ran this same location as a restrauant back in the day. The service was beyond reproach our glasses were always kept full and everyone was helpful and friendly. My beef tenderloin was outstanding... melt in your mouth and the desert rocked. The Valentine deal was well worth the value! Great food for a great price, Loved the Valentine’s Day menu! Went to Bistecca for Valentine's Day. They had a special on for $100 for a couple off a special menu. This included bread and oil and balsamic vinegar dip, a choice of two appetizers from 4 choices, a choice of two entrees from 4 choices, a dessert to split and a bottle of vine from 5 choices. Pretty good value for your money. We enjoyed the smoked leek and potato soup, tomato boccinni, Coq au vin and beef tenderloin with chocolate tiramisu dessert. It was all delicious. The service was good for how busy they were. Restaurant was decorated nicely and the noise level was good for how many tables were full. We will return in the future. My wife and I enjoyed a wonderful dining experience at Bistecca. Everything was excellent and there is no doubt that we will be returning in the future. 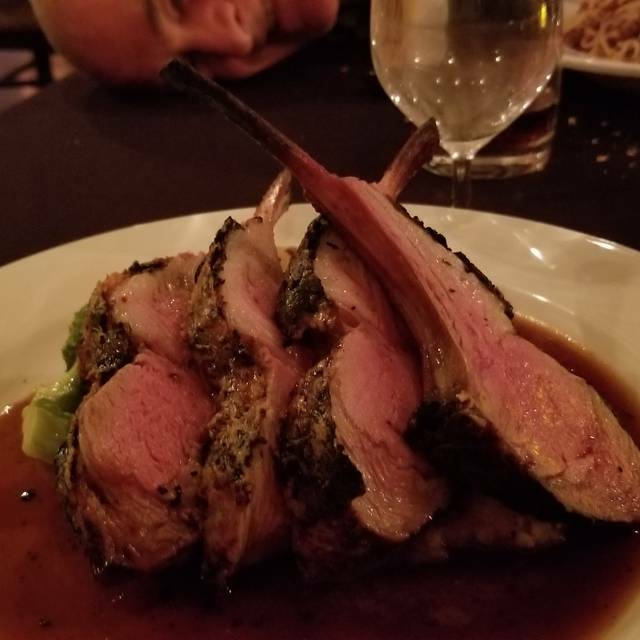 this was our first visit to Bistecca and we thouroughly enjoyed it. The food service and ambiance was great. I was really impressed and will be back. Will also recommend to friends and family. We have dined well in Italy, so Bistecca was up to some serious scrutiny. Both the pasta and the boulonnaise were homemade rivaling anything we had in Italy. The organic wine was very surprising considering it's price point. All in all, happy to have had the experience and will return. We very much enjoyed our dining experience at Bistecca. The wine and food were excellence. The wait staff was extremely professional and attentive. The ambience and decor make you feel very comfortable. We will certainly be back and will tell our friends. We enjoyed Bistecca. Their homemade pasta dishes were delicious as was the pork chop special. Lovely ambience and impressive wine list. You will not leave hungry from this fine dining experience. Roast beef benny was delicious. I can't wait to try the other brunch items jn the future! Service was excellent. Service was slow and wonder how to ask for a particular table. When using the open table you can’t. Had a nice time. Relaxed visit. Food was very good. Excellent wine selection. Local craft beer. Service was great. A bit loud, but we were seated in the elevated section, so it may have been quieter on the main floor by the windows. Looking forward to returning. Excellent, knowledgeable service and carefully prepared, unusual food. Amazingly fresh pasta and food. The servers were wonderful too. I have been to Bistecca twice now and I am already looking forward to the next visit, whenever that may be (I do not live in the Bruce County area). The steak was delicious! Cooked to perfection. The smoky old fashioned was delicious but also presented very originally and entertainingly! Enjoyed a very memorable evening here and was very happy with the ambiance and food - good variety, and limited but reasonable selection of wines. the appetizers were inventive, the entrees included typical and creative food choices, all in all a great experience and wonderful addition to the local dining venues!! Excellent menu selections and specials, acceptable wine list. Food quality, presentation and preparation is exceptional. Will dine here again on my next business trip to the town. This restaurant certainly deserves it's 5 star rating, very professional staff and a great dining experience. Bistecca never fails to satisfy us. Chef Alex's specials are very creative as he combines foods that I wouldn't normally see anywhere else. The service is exceptionally professional. Our meal was delicious and the dessert divine. Chef came out to speak with guests which is such a great, personal touch. Appetizers were unique and delicious. The fresh pasta was amazing. Wine list is the best in town. We'll be back soon for sure. Third time in a month .. Amazing as always very accommodating for food issues/ allergies.. what a treat!! Thanks again! !